Can Hulu keep 'The Handmaid's Tale' momentum going? If someone asked in 2016 which of the major streaming services would be the first to win the Emmy for Best Drama, most would have probably said Netflix. Yet, almost out of nowhere, it was Hulu that took home the award last year for "The Handmaid's Tale." The acclaimed dystopian drama returns Wednesday and with it comes a new opportunity for Hulu to expand its original content footprint against rivals like Netflix and Amazon. Hulu trails Netflix and Amazon in subscribers and production budget and it's the only one of the three that's not available globally (Hulu is only available in the US and Japan). And until "The Handmaid's Tale" came along, Hulu also trailed Netflix and Amazon in prestige. 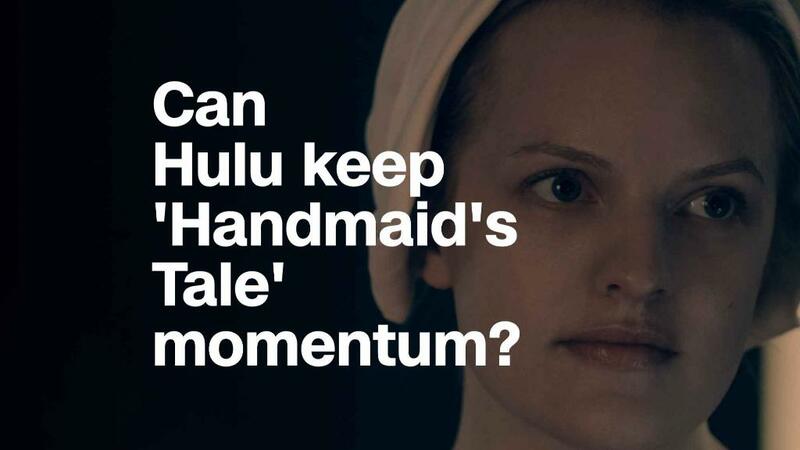 But with multiple Primetime Emmy awards, two Golden Globes and a timely story about a sexist society where women are reduced to roles of surrogate mothers, "The Handmaid's Tale" gave Hulu the original hit series it needed to compete seriously with its rivals. "'The Handmaid's Tale' is Hulu's 'House of Cards' or Amazon's 'Transparent,' its first original that is widely recognized," Michael Pachter, an analyst for Wedbush Securities, told CNNMoney. "It's important for these services to establish that they have unique content, although each of them largely carries exclusive licensed content, in order to persuade prospective users to subscribe." When Hulu announced in January that it grew to more than 17 million subscribers, the company credited the 40% bump to a host of factors including an expansion to more than "75,000 episodes of television across 1,700 titles -- more than twice the number of episodes available on any of the other leading streaming services." The service also used its recent accolades to promote itself as a "creative powerhouse" of original content. "Hulu has a ton of originals," Pachter said. "But few got the attention of 'The Handmaid's Tale.'" It's that kind of attention that can be a game-changer for a streaming service, according to New York Magazine's TV reporter, Josef Adalian. "A single successful series does not necessarily a network (or streaming service) make, but TV history has shown time and again that the right kind of hit can absolutely be transformative," Adalian wrote. "The streaming stalwart seems to have found its paradigm-shifting success." Even without its breakthrough originals, Hulu packs a punch with its content library. With old hits like "Seinfeld" and new hits like "This Is Us" to lure and keep subscribers, the service can both focus its strategy on finessing prestige originals while offering nostalgic and fresh content. The popularity of "The Handmaid's Tale" comes at an interesting time for Hulu, which is a joint venture between Disney, Fox, Comcast's NBC Universal and CNN's parent company, Time Warner. If Disney's bid to take over 21st Century Fox is successful, the Mouse House will have a majority stake in Hulu, allowing Disney to reshape Hulu's content and projects.